Brokerage Services - If you are looking to buy or sell your home or property check to see how we can help you with our discounted services. We have over 35 years of experience. Auld Ridge- Located in Licking County, south of Granville this community will feature 54 home sites on 163+/- acres, with 24.5 +/- acres of common area open space. Auld Ridge will offer the ultimate in privacy, a boulevard entrance passing a tranquil pond, traffic rotaries, and home sites ranging from 2.2 to 4.4 +/- acres. 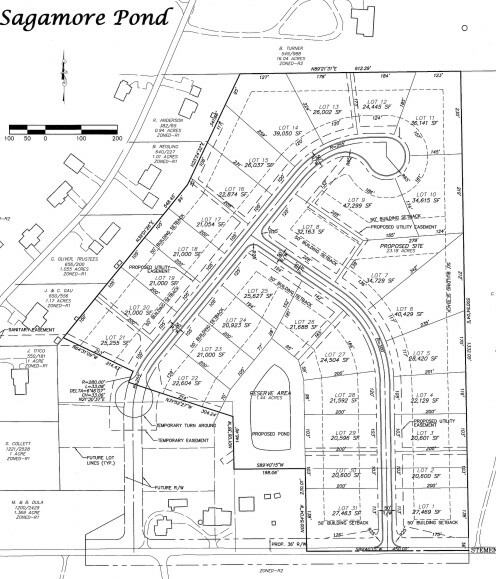 PHASE II NOW AVAILABLE WITH GREAT WOODED WALKOUT LOTS AVAILABLE!!! Timber Creek- A spectacular 100-acre site featuring 60 acres of woods, 65' of topography, and over 4,000' of frontage on the Lobdell Creek. Just southeast of Johnstown. Homesites from $44,600. Lot sizes from 2.8 to 7.7 acres. Northridge and Johnstown schools. 30 minutes from downtown. Sold out! Clear Creek Crossing- The ultimate in privacy. A gated community of 14 wooded homesites overlooking the Blacklick Creek. Lots from $119,900. Lot sizes 1.0 to 1.6 acres. Gahanna schools. All utilities. Sold out! The Wright Farm- Another beautiful site just south of Johnstown, with great views across the Raccoon Creek valley. Features include: walk out basements, 14 acre private park along the banks of the creek, 25 minutes from downtown. Homesites from $47,000. Lot sizes from 3.0 to 7.5 acres. Johnstown schools. Sold Out! Bennington Highland- Located in Licking County 7 miles northeast of Johnstown on Rt. 62. Many wooded lots, nice views. Lots range in size from 1.6 to 3.2 acres. Homesites from $37,000. Northridge Schools. 35 minutes from downtown. Sold out! The Border Place- We are currently offering lots for sale in Phase 1 of this 318-lot community located in Pataskala, Ohio. Licking Heights Schools. All Utilities. Sold Out! For homesite information please contact Maronda Homes. Jefferson Country Club- Located in Jefferson Township. Franklin County, Ohio. Previously owned and developed by principals of Dehlendorf & Company and others. The Dehlendorf Family are Founding Members. 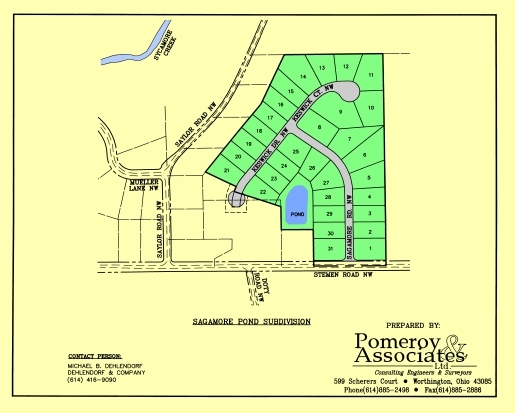 KyleMore- A 40 lot development located in Pataskala. Licking Heights schools. From $33,900. Sold Out! Muirfield Village- Located in Dublin, Ohio. Muirfield Limited. The general partner of Muirfield Limited was owned (in part) by the founder of Dehlendorf & Company. Wedgewoood Country Club- Located in Liberty Township, Delaware County, Ohio. All Lots and all memberships sold out. The Dehlendorf Family are Founding Members. Wolf Creek- A private trout fishing Club located in Coshocton County which also offers biking, bird watching, cabin rentals, fly fishing, hiking, hunting and limited spin fishing. Below please find a chart representing the anticipated 2006 Permit and Fee charges for building in both Violet Township and Pickerington. As you can see Violet Township is approximately $5,000 less than Pickerington to build in. Sagamore Pond is located within the Pickerington School District but NOT within the Pickerington City Limits.